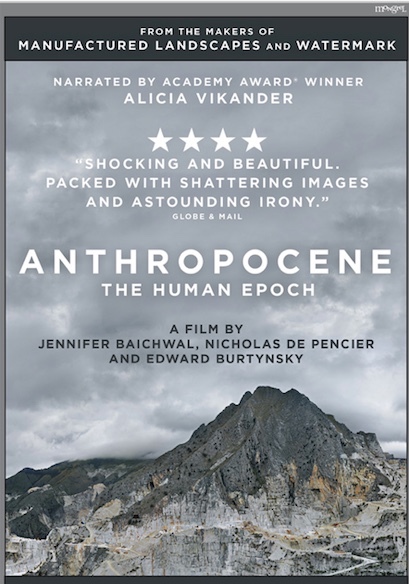 “Anthropocene: The Human Epoch,” the latest eco-doc from Jennifer Baichwal (“Manufactured Landscapes,” “Watermark” both NOSFA films) co-directed by Edward Burtynsky and Nicholas de Pencier, shows viewers some of the large-scale changes we are making to the planet. They are equal parts stunning and scary. There are the world’s largest excavating machines, straight out of a sci-fi nightmare, as they gobble Germany’s farmland. We visit the largest garbage dump in Africa, a scavenger’s mecca that grows by 10,000 tonnes of trash each day, near to where 750,000 people live. There’s a stop at Norilsk, the most-polluted city in Russia, where kids ride their bikes near oil and chemical plants. However, not all the film’s segments are doom-and-gloom. The film visits an electric-car-battery plant in Michigan, and delivers a time-lapse trip through the 57-kilometre Gotthard Base Tunnel in Switzerland, which will reduce the dangers and pollution of trucking freight along mountain roads. There are opening and closing scenes of Kenya’s Nairobi National Park, where mammoth mounds of elephant tusks are set ablaze to stop them being sold on the black market. The movie takes its title from the Anthropocene epoch, a proposal that we rename this time period (currently known as the Holocene) as the Anthropocene, to mark the dubious honour of the time when Homo sapiens began to significantly affect Earth’s geology and ecosystem. The filmmakers’ stunning images, captured around the world, make it clear that whenever it started, it is scarily ongoing.